This is my movie review of the recent 2015 religious film titled, “WAR ROOM.” As far as movies go in general, I think it is excellent. However, spiritually, I have some serious issues with the film. The script has a definite plot, which promotes prayer and going the second mile to save one's marriage. I love anything that tries to build and save marriages, not destroy them like Hollywood. The movie strongly encourages the viewer to have a definite life of prayer and get a hold of God for others. It is a very good film in that respect. However, in our text verses from Proverbs, the Holy Bible repeatedly warns that “The Lord is far from the wicked.” Matthew 6:7-8 tells us not to be like the heathens when we pray, who think they'll be heard for their much speaking. The Bible recognizes that unsaved heathens do pray. Muslims, who openly reject Jesus as the Christ, are reputed for their much praying to Allah (a false god). They are heathens praying in vain to their false moon god. Likewise, Catholics chant their recited prayers in vain to a statue of Mary. I couldn't help but cringe inside as I watched WAR ROOM, hearing the worldly music of Contemporary Christian Music (CCM) imposters like TobyMac, Matt Maher and Steven Curtis Chapman. Mr. Chapman is one of umpteen CCM phonies who masquerade as Biblical Christians, while supporting the satanic Roman Catholic Church. Search online and you'll find that unsaved Roman Catholics, Mormons, Seventh-day Adventists and other satanic religious cults praise and support religious films such as WAR ROOM. It's called “ecumenicalism” (or ecumenism) and it's of the Devil. Roman Catholicism is based upon the commandments of men. Contemporary Christian musician Stephen Curtis Chapman performed on August 6, 2006, at the Roman Catholic Youth Fest in Cleveland, Ohio. The Fest, which began in 2000, featured a Catholic Mass performed by Bishop Anthony Pilla and the practice of auricular confession to priests. In typical CCM fashion, Mr. Chapman, by his sinful actions, proved that he cares nothing about sound doctrine and repudiates the practice of Biblical separation from satanic error. Steven Curtis Chapman wrote the main song for the film WAR ROOM, titled, what else, “WAR ROOM.” We are certainly engaged in a spiritual war in this world, but for anyone to produce a movie encouraging people to go to war in their prayer closet, while totally ignoring the raging war of Roman Catholicism against the Gospel of Jesus Christ, is religious incompetence at its worst. 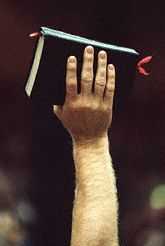 Every Christian believer has a Biblical responsibility to preach the Gospel. 2nd Corinthians 4:3, “But if our gospel be hid, it is hid to them that are lost.” This must definitely include contending for the faith, warning people what is not the Gospel as well. Roman Catholics add the keeping of 7-sacraments to the Gospel, which is “ANOTHER GOSPEL” (2nd Corinthians 11:3-4). In Acts 15:1 we read of a similar false group of heretics, “And certain men which came down from Judaea taught the brethren, and said, Except ye be circumcised after the manner of Moses, ye cannot be saved.” Just as unsaved Roman Catholics, so also did these false prophets add circumcision to the Gospel. Seventh-day Adventists add good works, keeping the Sabbath Day, and water baptism to the Gospel. Mormons add water baptism, as do Jehovah's Witnesses and the Church of Christ to the Gospel. The film WAR ROOM hurts people, giving false security to unbelievers, failing to tell them the truth that only a born-again Christian has a right to God's throne of grace (Hebrews 4:15-16). The prayer of the Catholic is an abomination unto God, because they are trusting in the sacraments of the Catholic church to save them, instead of wholly trusting Jesus Christ (Hebrews 4:10-11). Because of the satanic ecumenical movement—led by apostates such as Billy Graham, Benny Hinn and Rick Warren—the churches have become silent, dipping their sails in sinful compromise, repudiating their duty to expose all satanic error. As long as I have breath, and as long as I have a voice in cyberspace, I will preach against the evils of false religion in all its forms. Ephesians 5:10-11, “Proving what is acceptable unto the Lord. And have no fellowship with the unfruitful works of darkness, but rather reprove them.” Christians ought to reject and expose any music, books, sermons or works that cater to and encourage Roman Catholics in their wickedness of doctrinal error and unbelief. It is intentional that everything religious nowadays being sold and promoted via the internet is wishy-washy, vague and shallow. The WAR ROOM film's writers and producers say that it's not about money, but they are lying deceivers. They're raking in tens-of-millions-of-dollars. Of course it is all about money. WAR ROOM appeals to nearly all religious faiths, most of whom are satanic false religions. Psalm 7:11 says that God is ANGRY with the wicked every day. John the Baptist said in John 3:36 that the WRATH OF GOD abideth upon the wicked. Roman Catholics are wicked, because they substitute sacramental salvation for the Gospel. Mormons are wicked, who adhere to a sexually perverse false religion that denies the deity of Jesus Christ, and claims that Jesus had many wives and beared many children. It is blasphemy! Steven Curtis Chapman is the enemy of God, because he is a friend of the world, hobnobbing with hellbound Roman Catholics. James 4:4, “Ye adulterers and adulteresses, know ye not that the friendship of the world is enmity with God? whosoever therefore will be a friend of the world is the enemy of God.” Something is very wrong with a professed Christian who makes a living singing music that appeals to hellbound Roman Catholics. This is the typical apostasy of the CCM gang. I triple-dog dare you to show me even one mainstream CCM artist who presents a clear presentation of the Gospel on their website. They only care about worldly success and making money. Steven Curtis Chapman has a net worth of $5,000,000!!! It's all about money! The film WAR ROOM is that it is extremely ecumenical, appealing to all the pseudo (false)-Christian religions. Mormons, Jehovah's Witnesses, Lutherans, Seventh-day Adventists, Church of Christ, Christian Science and Roman Catholics are all unsaved religious groups, who have ANOTHER GOSPEL, ANOTHER JESUS or ANOTHER SPIRIT (not the Holy Spirit). The film WAR ROOM (as does the entire ecumenical movement) gives a false sense of security to unbelievers, leading them to believe that God accepts their prayers even though they have never been born-again. Biblically, as our text verses evidence, God is far from the wicked and will not hear their prayers. So who are the wicked? They include unsaved people. Don't make the mistake of thinking that only open Christ-rejecters are not saved. In fact, many unsaved people are religious churchgoers and actually believe that Jesus is the Christ Who died on the cross, was buried and raised up the third day. So why aren't they saved? It is because they have adopted a works-based false plan of salvation. There are numerous ways to corrupt the Gospel, either by adding to it, subtracting from it, or redefining it from what the Bible teaches. Any religious film, book, course, song or work which caters to unsaved heathens, offering them false hope and security in their reprobate ways, is OF THE DEVIL. Mormons deny the deity of Jesus Christ. Mormons believe that as Christ achieved godhood, so shall all faithful Mormons attain godhood. In sharp contrast, the holy King James Bible teaches that Jesus is almighty God (Revelation 1:8), and was never created. Jesus created all things (John 1:1-3,14), including the universe, angels and Heaven (Colossians 1:16). All of the modern counterfeit Bible versions change “by” to “through,” that is, they erroneously claim that all things were created through Christ, not BY HIM as the King James Bible faithfully renders. Beware of all new Bible versions, which teach that God the Father created all things through Christ. The Holy Bible teaches that Jesus created all things AS GOD!!! All of the modern Bible versions (which originate with the satanic Greek texts of Westcott and Hort) horribly attack the deity of Christ. Everything being produced today is lame, lukewarm, wish-washy, non-offensive, vague, lacking doctrinal substance and really saying nothing at all. Beware of ecumenism in the churches!!! Beware of occultists substituting spirituality instead of theology in the churches. The Devil is working relentlessly to infiltrate and corrupt the churches, including independent Baptists churches. More than half of all Baptist churches nowadays are teaching Seventh-day Adventist doctrine, which is what Lordship Salvation is. My friend, the Bible teaches that we are saved by “the simplicity that is in Christ” (2nd Corinthians 11:3-4), which means to simply BELIEVE the Gospel to be saved. WAR ROOM does mention the redeeming blood of Jesus, but fails to focus on the three elements of the Gospel: Christ's DEATH on the cross for our sins, His BURIAL and His RESURRECTION the third day (1st Corinthians 15:1-4). The film does teach the heresy of Lordship Salvation. Another problem with the movie WAR ROOM is that the movie promotes a satanic Bible version; namely, the English Standard Version (ESV). Also, the film promotes the satanic music of tobyMac, a sellout Contemporary Christian Music (CCM) singer in the New World Order. Check out tobyMac's ungodly album, “Eye On It.” The film also promotes the apostate CCM of other religious imposters, some of whom fully support and ARE Roman Catholics. Furthermore, several women are wearing tight slacks in the film, dancing to jump ropes, inappropriately dressed. 1st Timothy 2:9 commands women to dress in modest apparel. It is a shame that unsaved Seventh-day Adventists, Mormons and Amish women have higher moral standards than our independent Baptist churches do these days. God hasn't changed, our wicked culture has. In the year 1900 in the United States, you couldn't find a women wearing pants in public. Woe Unto America: The Great Satan! We are living in some evil, twisted and confused times. There are a bunch of nuts on the internet. I watched a YouTube video today (with over 330,000 views) by some religious nut who actually said he doesn't think sexual lust is a sin. He claimed that Christians who preach against lust misinterpret Matthew 5:28 in the Bible, where the Lord said lusting upon a woman is the same as adultery. The video's author claims that Christians misunderstand the Lord's warning. What a reprobate! The Scriptures plainly teach that lust entices a person, which conceives sin. James 1:14-15, “But every man is tempted, when he is drawn away of his own lust, and enticed. Then when lust hath conceived, it bringeth forth sin: and sin, when it is finished, bringeth forth death.” Lust is a sin. Sexual lust is a sin. Engaging in lust doesn't prevent sexual sins. Every man contends with lust. There is no escaping it, except to resist the temptation as the Bible teaches in 1st Corinthians 10:13, “There hath no temptation taken you but such as is common to man: but God is faithful, who will not suffer you to be tempted above that ye are able; but will with the temptation also make a way to escape, that ye may be able to bear it.” No man can avoid temptation, but we can escape as per the Lord's promise to make a way of escape. A word of praise is that the film promotes the Biblical truth that a wife has incredible power over her own husband (1st Peter 3:1). Feminism has brought the Devil into our marriages, homes and churches, corrupting and ruining our society. Feminism is synonymous with pride, rebellion, sexual immorality, abortion and homosexuality. Feminism is a horrible evil, where a woman elevates herself above God's authority, by refusing to obey her husband. A godly wife will not abandon ship, but hang in there by prayer. The movie WAR ROOM does encourage prayer, which I commend certainly. It bothers me that an elderly woman is the star of the film. Where are the godly men? Why is it Mothers Against Drunk Drivers instead of Fathers Against Drunk Drivers? Where are the godly men? America is being controlled by women today, because men aren't men anymore. Case in point are America's wimpy pastors who are lukewarm, refusing to take a stand against Satan's counterfeit Bible versions, and refusing to refute Satan's plan of Lordship Salvation, and afraid to preach hard against sin as they ought. By refusing to fight, our churches are dying, inviting the Devil right into the midst of the congregations. Beware of the emerging apostate churches. My friend, you can turn your entire house into a prayer home, but God will not listen to anything you have to say until you first get saved. Jesus warned in John 3:1-7, “YE MUST BE BORN AGAIN!! !” The new birth is a miracle of God in response to a person's faith in the Gospel of the Lord Jesus Christ. I'm tired of false prophets saying that you can't just pray for God to save you, write your name and date in the front insert of your Bible, and then think you are safe and secure for the rest of your earthly life, regardless of how you choose to live your life. Well friend, that is what it means to be born into God's kingdom and family. Just as you were born physically into the world, which had absolutely nothing to do with you, nor with how you chose to live your life afterwards; likewise the same is true of your spiritual birth (if you've been born-again by the Holy Spirit of God). Most people who think they are saved are not. They merely have religion. They understand and speak of being born-again in terms of “an experience,” rather than a new birth as the Scriptures teach. I've heard numerous unsaved false prophets speak of being born-again in terms of a new direction in life, a changing from one's past ways, a transformation of priorities; but none of these are the new birth. Our churches are filled with spiritual miscarriages. They almost got saved, but at some point the Devil pulled a Bait & Switch fraud on them, substituting religion and spirituality in place of the new birth by God's Holy Spirit and Biblical theology. A demon's favorite activity is making people feel comfortable in their false religion, without ever being born again. Satan's greatest weapon is to con people into living the Christian life without ever being born again. Religious films like WAR ROOM appeal to most of the different religious denominations, because it is so vague and really says nothing of benefit to get people saved. I went to the official WAR ROOM movie website, looking for the plan of salvation, but it is not found. All I found was that they are selling upwards of a hundred movie-related products. What hypocrites. The film's producers claim they aren't doing this for money. I think they are liars; of course they're doing this for money, and they're making LOTS OF MONEY!!! Ecumenism is one of the most dangerous threats to our country, families and churches today. Ecumenism is Satan's way of breaking down the walls of Biblical separation between evangelical churches and the satanic religious cults. By focusing on common denominators between the differing groups, and disregarding their major differences, social harmony is often established. The consequence of establishing such social harmony is the unlikelihood that either group will take a strong stand against each other in the future, as they did previously. Over time, all conflict is gone, and the various groups become spiritually dead, useless for God. In effect, ecumenicalism means making peace with God's enemies, when there is great cause for no peace. Billy Graham has made peace between evangelical churches and unsaved Roman Catholics. As an adverse result, churches no longer speak out against the evils of Roman Catholicism, and Roman Catholics are more comfortable than ever on their way to Hell without Christ. The Devil's greatest weapon is to con people into living the Christian life, without ever being born-again. You can empty out your closet and pray until you're blue in the face, but if you're not a born-again Christian, God will not hear you. God is far from the wicked according to Proverb 15:29. Prayer is asking. God also asks things of us in the Scriptures. What right do we have to ask things of God, if we do not do the things that He asks of us? Most people only pray when they need something from God, usually when they're desperate. You'll come a lot closer to receiving answers to prayer, if you do what God asks of you in the Word of God. James 4:6 says that God resists the proud, but gives grace to the humble. Satan loves ecumenism, which is nothing more than sinful compromise. Our churches were much better off when we were regularly having splits. Due to false doctrines creeping into the churches, faithful men of God often refused to cooperate, and a church split ensued. Many of the earlier preachers withdrew from the apostate Southern Baptist Convention. Today, we need church splits more than ever before. Instead, apostasy has set into the churches like rigor mortis in a dead corpse. Today's youth lack the convictions that folks who grew up during The Great Depression had. People used to believe and stand for something, but today people bend like coconut trees. Today's youth are confused, misinformed, lazy and extremely worldly. They're characterized by selfishness, short-tempered, lack of understanding, and a total disdain for their elders. These are the consequences of being raised in a spoiled generation. Prosperity has ruined a hundred times more men than adversity ever did. Add to that the absence of God and prayer from student's daily school curriculum and you've got a recipe for disaster. This was all intentionally planned by the Illuminati to destroy our American culture. Freemasonry's secret plan for America is to raise up a New World Order from the ashes of our destroyed empire. In order to succeed, they must destroy their resistance, which includes getting rid of: Christianity, the traditional family, individualism, the Bill of Rights, U.S. Constitution, patriotism and national sovereignty. Once you understand this, it will make sense why our youth are under relentless satanic attack nowadays. I noticed that apostates Kirk Cameron and Franklin Graham endorsed the film WAR ROOM. Both of those false prophets teach the heresy of Lordship Salvation. Here is the nightmare theology of Billy Graham. And, here are some more of Graham's apostate teachings. The Holy Bible never guarantees answers to prayer. The Lord is far more concerned about our spiritual growth than He is about granting our Christmas list of wishes. Most people approach God selfishly in prayer, only asking God to improve their quality of life. When the slot machines don't produce, and God doesn't provide on demand, they quit praying and criticize God for the rest of their life. That's how heathens think. As believers, we ought to pray and then trust God, not expecting visible results. God often works behind the scenes, in mysterious ways that we don't understand. God's works are mysterious to us because we don't understand god's methods. It is a true saying that God's hand working is seen, not in months or even years, but in decades. It is also true that when we cannot see the hand of God, we should trust the heart of God. Prayer is a matter of faith. Philippians 4:6-7 teaches us to pray about everything, and not to worry, and then to claim the peace of God that passeth all understanding, keeping our hearts and minds in Christ Jesus. The film WAR ROOM brilliantly promotes having a prayer closet, and praying for others, and mentoring youth to pray. I think all these these are wonderful, powerful and needful to teach. Albeit, as I have outlined in this article, to make unsaved Roman Catholics feel comfortable in their wickedness of unbelief is damaging, harmful and totally apostate. God does not hear the vain prayers of Catholics, because they elevate Mary over Jesus, and trust in the sacraments for salvation, which is a false plan of salvation. Hell will be filled with both Roman and Russian Orthodox Catholics alike. I say this kindly, but truthfully, with Biblical authority. The Bible teaches in Ephesians 6:12 that we are engaged in a spiritual war. We are Christian soldiers for Jesus Christ. Our battle is against false religions, false Bible versions, false doctrines, false Christs and false prophets. When I enter into my prayer closet, I pray for the Catholic church to burn to the ground. When I enter into my prayer closet, I ask God to break the stubborn pride of America's tens-of-thousands of sinful pastors who teach the demonic heresy of Lordship Salvation. When I enter into my prayer closet, I pray for God to bring our nation's wicked leaders to justice, and to execute divine retribution upon them for all their evils against humanity. When I enter into my prayer closet, I ask God to punish all the CCM phonies, thieving televangelists and satanic hoaxes like Rick Warren, Billy Graham, Joel Osteen, John Hagee, Benny Hinn and The 700 Club. That's what I pray for. The 700 Club and are their accomplices in the Charismatic Movement, treat the blessings of God like a Las Vegas gambling casino, where you put in your money, pull the handle, and see what happens, hoping to hit it big!!! The health, wealth and prosperity Gospel is a fraud. Charismatics say to give-to-get, and the more you give them, the more you'll get from God. Statistics prove otherwise. In the first place, God doesn't return anyone's money for being dumb enough to give to charlatans, con-artists and unsaved reprobates. God gives us each a brain at birth, and we need to research the Scriptures about money and giving, before we do as stupid does. Common sense ought to tell us that these televangelists are bogus frauds. Why give your hard-earned money to some bozo like Benny Hinn, who extravagantly spends $10,000 a night to stay in hotels, when you could give $20 to a homeless person on the street who hasn't had a decent meal in a long time? I tell you, God will bless you more for giving $20 to a poor person on the street, than He will if you give $10,000 to some religious shyster like Benny Hinn (Sin). Please don't be a fool when giving to ministries. The producers of the film WAR ROOM are making tens-of-millions of-dollars from just this one movie. They're getting filthy rich!!! I ask God to bring judgment upon America for our wickedness, and to make Americans suffer like they've never suffered before, to humble us and drive us to our knees. We need and deserve punishment. We've murdered nearly 60,000,000 precious babies by abortion. We've allowed kooks, quacks and queers to take over our nation, driving God out of the classrooms, and bringing in Communist subversion and the bogus satanic lies of Evolution to indoctrinate our children with atheism. Not surprisingly, crime rates are soaring across the nation, and yesterday's God-deprived youth are today's nutcase adults and insane whackos of society. Each generation is getting more and more devoid of morals, just like Karl Marx and Vladimir Lenin dreamed. You haven't seen anything yet. Sodom and Gomorrah will seem like nice places to live compared to what's ahead for the United States. Woe unto America! There's a war on for men's souls. WAR ROOM fails to bring the battle to the field where it belongs, fighting against the New World Order, against the rulers of the darkness of this world, against the Roman Catholic religion, against Mormonism, against Seventh-day Adventism, against the Church of Christ, against the Lutheran religion, against Judaism and Zionism, against Islam and Buddhism, against Hinduism and other eastern false religions. Everywhere we turn, we see the spiritual battle around us, including the demonic CCM music promoted by the WAR ROOM film. When pro-Catholics are involved in making movies; such as, WAR ROOM, about prayer for Christians to go see, I have to speak up as a born-again believer and expose the bogus Catholic religion for the massive satanic fraud that is really is!!! You're not going to win any prayer battles in your closet if you're supporting the biggest religious cult on the planet, which is Roman Catholicism and the ungodly devilish Pope. The Pope is the vicar of Hell beneath, and not God above. The Pope does NOT speak for God, nor has he ever done so. God has chosen to speak to us in these last days through His son, Jesus Christ, Who is the Word of God, according to Hebrews 1:2. The problem with the movie “WAR ROOM” is that it doesn't point you to the battle field. The film WAR ROOM is like America's open southern borders. While Americans are being criminally, shamefully and needlessly harassed by TSA in airports all across the nation, any illegal immigrant (many are criminals) can just walk across the order and enter into the country with nukes or biological agents. Likewise, while an elderly grandmother is prayer for her friend's marriage to pull through in WAR ROOM, a billion Roman Catholics are all hellbound in their sins without Christ, trusting in their sacramental salvation to get them to Heaven. This is how retarded religious people are today. They're far more concerned about one marriage, than they are about the eternal destiny of one billion souls. They'd dare not ever criticize the Catholic religion, because that would cost them tens-of-millions-of-dollars, because the average Catholic is so shallow in their beliefs that they're easily duped. That's why Jack Van Impe years ago praised Pope John Paul II as, the greatest spiritual leader of the 20th century. Vomit!!! Evidently many of Jack Van Impe's book sales come from dumb Catholics who don't know any better, so he coddles them. It is apostasy! It is high time for Christians to get upset and take a stand against every work of darkness. Prayer is needful, but the greater truth needs to be told that God only hears the prayer of those who've been born-again by faith alone in Jesus Christ. God ignores the wicked who pray. No unsaved Roman Catholic is going to unlock the windows of Heaven through prayer, because God is angry with the wicked every day, even at their prayers, which are an abomination unto Him. God does not answer the prayer of those reprobates who teach and trust in the heresy of Lordship Salvation.